Spray a skillet with nonstick spray. Quickly saute the meat and raw vegetables until the meat is just barely cooked on all sides. Add to a 4 quart slow cooker. Stir. Add in the spices, tomatoes and beans. Stir to evenly combine. Cook on low 7-8 hrs and then high until ready to serve (up to 2 hours). Stir prior to serving. 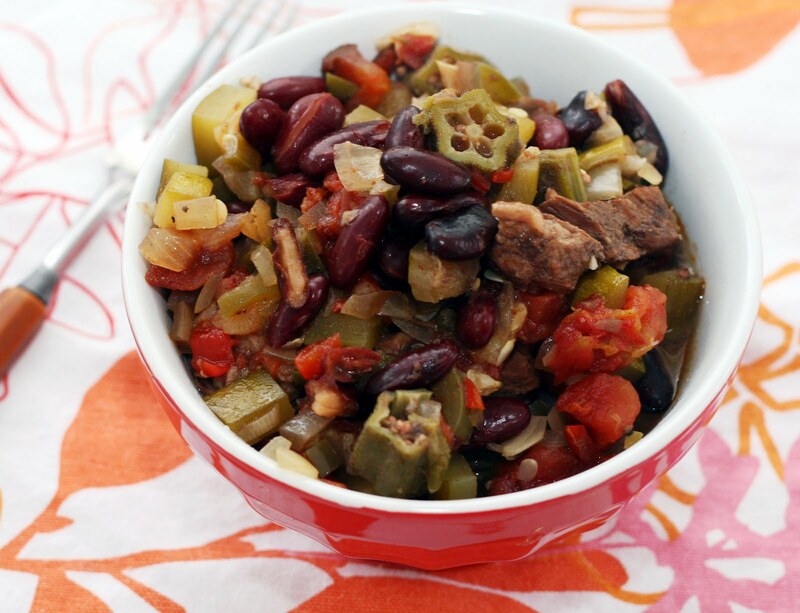 I love using the slow cooker in the summertime so I don't heat up the house with my cooking. One can't spend all their meals eating salad. This chili is a great way to use the best of the summer produce in a heartier way. I used some seasonal, local ingredients (the zucchini, okra and peppers) in this one but still used canned tomatoes because 1. they work great in the slow cooker and 2. when fresh tomatoes taste this great, I'm eating them raw. Note: if you leave out the meat and the Worcestershire sauce, this would make a lovely vegan chili. I just added the meat for a little extra protein and the Worcestershire sauce for a punch of umami. In a 12 inch skillet, melt the Land O Lakes Butter with Olive Oil & Sea Salt. Add the zucchini, corn kernels, onion and peas. Stir fry until the vegetables begin to soften, about 3-5 minutes. Sprinkle with Tuscan seasoning, salt and pepper. Continue to stir fry until the vegetables are fully cooked, about 10 minutes. 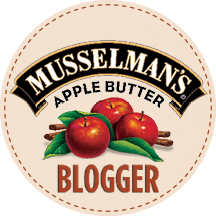 Land O'Lakes asked me a few other bloggers to come up with recipes using their butter with olive oil and sea salt. 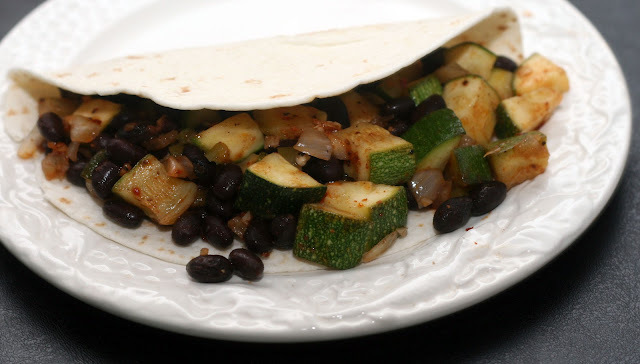 Since it was summer, I knew I had to make something with zucchini because who doesn't have some zucchini to use up? I also included some June peas which were in season at the time but tragically are out of season now. I think frozen peas might be just as good in this recipe but I haven't tried it out myself. 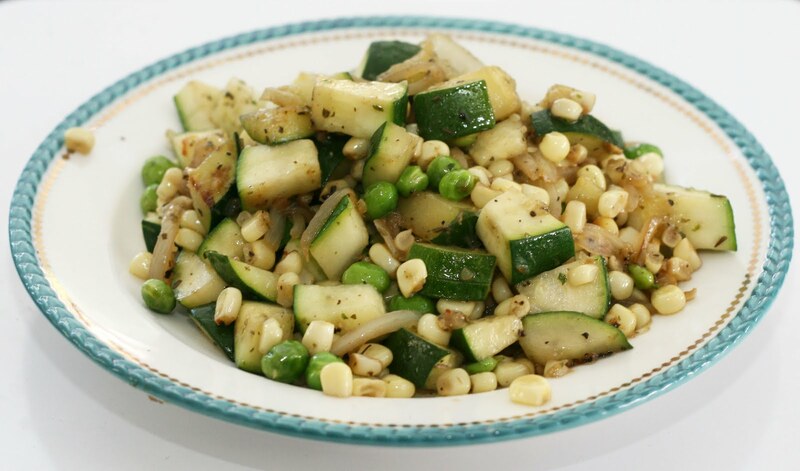 I have to say, this is one of my favorite and easiest side dishes of the summer. Honestly, if you served it over quinoa or rice it could be a whole meal. In a medium sized bowl, add all of the meatball ingredients. With a gentle hand, combine all ingredients and form into 1 to 2 inch meatballs. Bake on a broiling pan until cooked through, about 20 minutes, turning once. Arrange the meatballs on the rolls, drizzle with sauce. 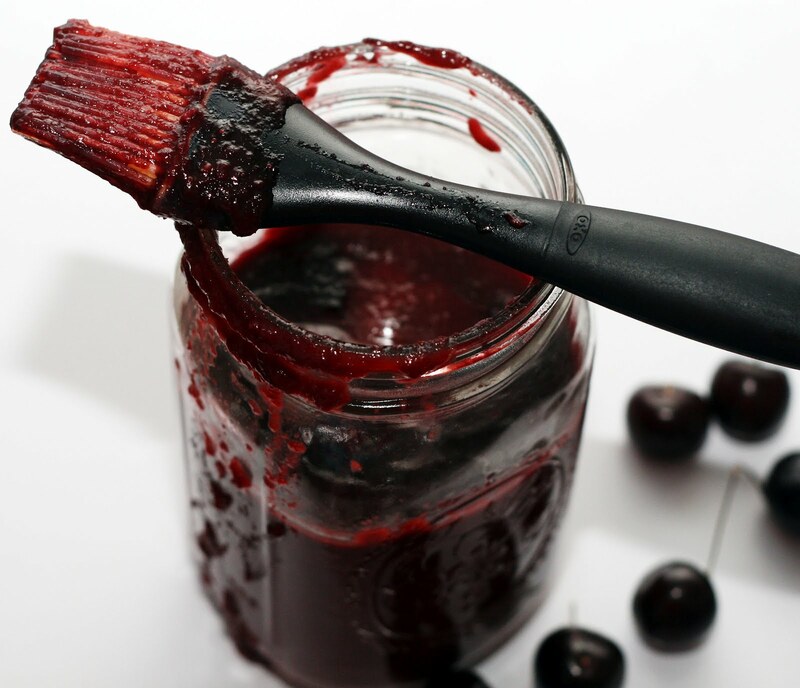 Someone emailed me and asked what we did with the cherry barbecue sauce I posted earlier in the week. I did a number of things with it (I made a lot) but perhaps the most fun thing was these sandwiches. Since cherries have been so cheap lately (under $2/lb at the regular supermarket) we've had a lot on hand. So I added them to some turkey meatballs. My reasoning was that if turkey goes well with cranberries, than why not cherries! Luckily I was right! These are some tasty meatballs. I think they are pretty healthy as these things go too, ground turkey is lean, cherries are good for you and they are baked instead of fried. The sauce is pretty low fat too so you don't have to feel bad about eating a meatball sub on a random Tuesday. Note: If you won't want to bother making the sauce, the meatballs are tasty without it as well! Preheat oven to 350. Grease or line 12 wells in a muffin tin. In a large bowl, mix together milk, sugar, oil and egg until light and fluffy. In a separate bowl, whisk together the salt, flour, cornmeal and baking powder. Add to the wet ingredients and mix until just combined. Fold in the zucchini. The batter will be rather thick. Spoon batter into prepared wells, filling each 2/3 of the way. Sprinkle with cheddar. Bake for 12-15 minutes or until a toothpick inserted in the center comes out clean. Cool in pan for a few minutes, then invert on a wire rack. Eat warm or at room temperature. Note: I used white cheddar so it is difficult to see but it is there! It is that time of year again. 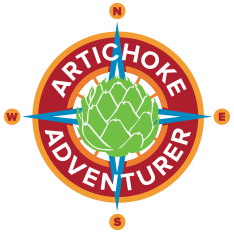 The weeks when I am inundated with requests for zucchini recipes. We didn't plant zucchini this year but we did plant some crookneck squash that a friend of my mom gave us and it did so well, we might have to switch our garden next year to summer squash only. Our tomatoes never do well, no matter which ones we plant or where. Which is a shame because they are my favorite! I love zucchini too so having to much is never an issue for me. This muffin was Matt's idea. 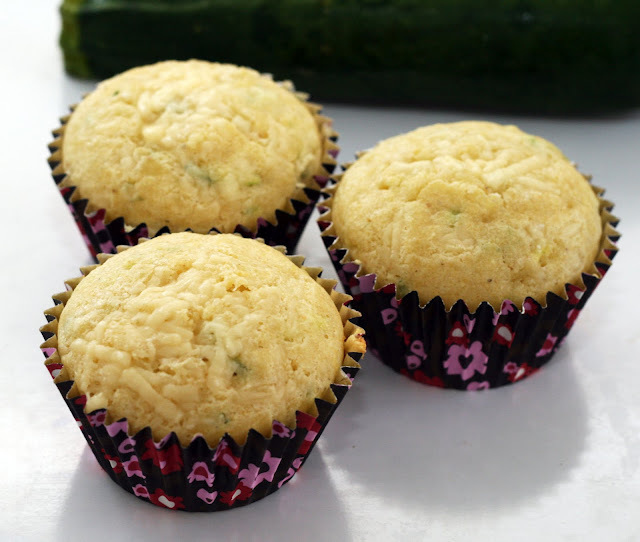 He felt like cornbread to go along with some summer chili I was making and he loves zucchini so I developed this recipe. It is sort of a cross between zucchini bread and cornbread. It is really moist and the hint of cheddar just pushes it over the edge into a new level of deliciousness. Pulse all ingredients in a blender until smooth. Pour into a small saucepan and simmer on the lowest setting until heated through and it reduces and thickens, about 15-25 minutes. Allow to cool. Keeps in the fridge about a week in an air-tight container. This was an amazing sauce. I love experimenting with barbecue sauces because I can make them ahead of time (and with little hands-on effort) and have them on hand for grilling or sandwiches or salads or whatever. 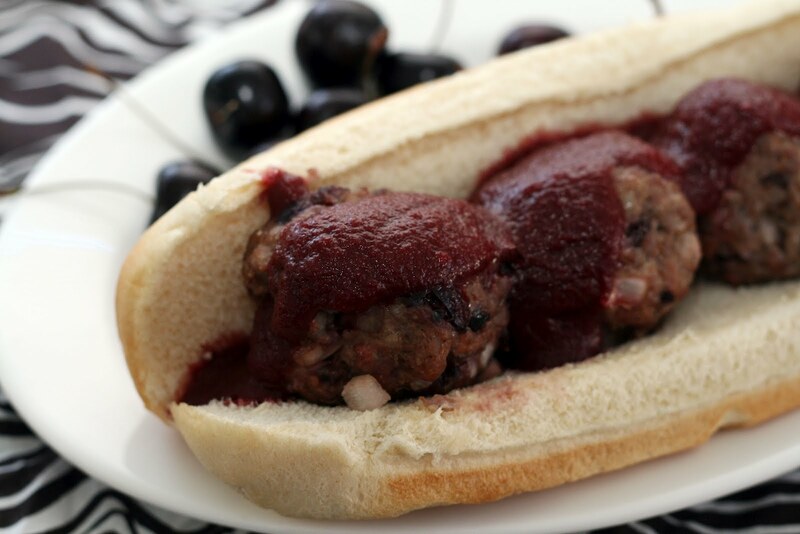 I used cherries for this one because they are in season right now and really delicous. They added a ton of flavor and body to the sauce. 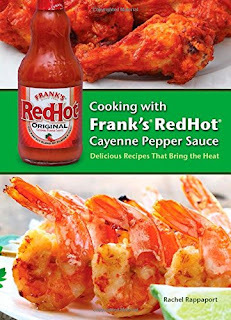 Note: It is easy to make a double batch of this sauce. Saute the onion, garlic, jalapeno and zucchini until the onions are translucent and the zucchini is soft. Stir in the remaining ingredients, cook until heated through. This was our vegan option for our taco night and I think it was a hit! Even the picky eaters liked it. I had guacamole, 3 kinds of salsa, pickled jalapenos, crumbled queso fresco, vegan and regular sour cream, red cabbage, lettuce, tomato, avocado and red onion on hand for toppings. While I made this in a skillet it kept warm really well in the triple slow cooker I bought especially for the party. We just formed a line and assembled our tacos as we went! Heat oil and butter in a large saucepan over medium heat. Add the vegetables. Sauté until the squash starts to soften and the onions are translucent, about 5-10 minutes. Add the bay leaf, salt, pepper, lentils, and stock. Cover and simmer for about 40 minutes or until the lentils are soft. Meanwhile, grill, broil or sauté the sausage until fully cooked. 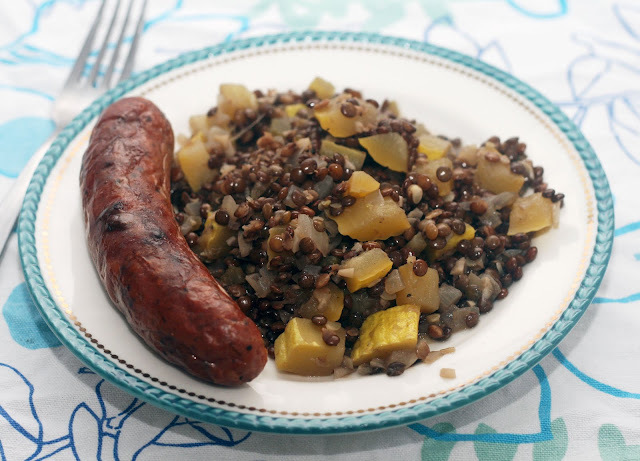 Serve the sausage on a bed of warm lentils. *I used these Toulouse Garlic sausages. Excuse my French if the title is incorrect! I'm relying on high school French here! I was excited to make this dish because I finally got my hands on the French sausages that I love but are difficult to find outside of a restaurant menu. I've seen them served with du Puy lentils (the real kind! Don't be fooled by imitators!) before but it is normally a heavy, wintery dish. In deference to the season, I lightened the classic up quite a bit and instead of root vegetables** I used some crookneck squash from our very own garden. And what a squash it was! I almost ate it freshly picked, it was so sweet smelling. But I resisted and instead incorporated it into this dish where cut the richness of the sausage. **I have a good root vegetable du Puy lentil recipe in my last cookbook. Sprinkle both sides of the steak with salt and pepper. Quickly cook on a very hot skillet, turning once. Place each steak on the bottom half of each roll. Top with cheese, bacon, ham, egg, tomato and olives. Spread mayonnaise liberally on the top half of the roll and then close the sandwich. When I found out that “Around the World in 80 Plates" will be in Uruguay this week (July 18th, 10/9c) I was excited because I finally had an excuse to make chivito, the national sandwich of Uruguay. Delicously over the top, this is not an every day sandwich! 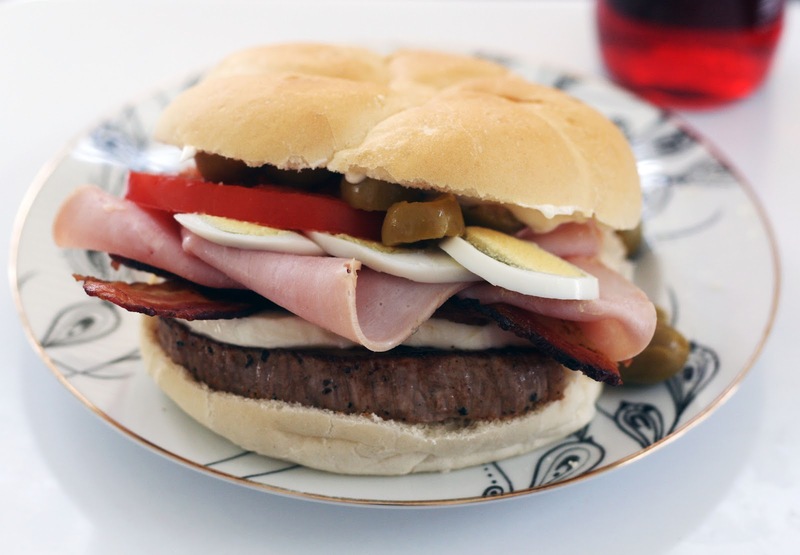 There are several different ways to make a chivito but they all include a thin steak topped by eggs (fried or hard-boiled), bacon, ham, olives (black or green) and mayo. It sounds a bit odd but rest assured, it is a wonderful, incredibly savory sandwich. The origins of the sandwich are a bit hazy. Apparently someone came into a restaurant asking for a goat sandwich (chivito) and since they didn't have goat, they made this instead. Not sure why they just didn't give them a plain steak sandwich but I have to say, this one is much better! Place the corn cobs and bay leaf in a heavy bottomed 6 quart Dutch oven. Fill with water. Bring to a boil. Continue to boil for 30 minutes. Strain into a large measuring cup. It should measure about 4 cups. Pour the liquid back into the Dutch oven. Add the sugar and pectin and bring to a rolling boil. Boil until it "sets" into a jelly-like texture, just a few minutes. Ladle into jars, leaving a 1/4 inch headspace and process 15 minutes using the hot water method. *I used cobs leftover from making things like this. Not cobs I had eaten off of or were previously boiled/grilled. Because I am not an expert corn cutter-offer, there was some corn left on the cobs (mostly half kernels) which added flavor. Until I went to Nashville in May, I had only heard of corn cob jelly. Then I was served it with some fried green tomatoes and it was so good, I had to make it myself. 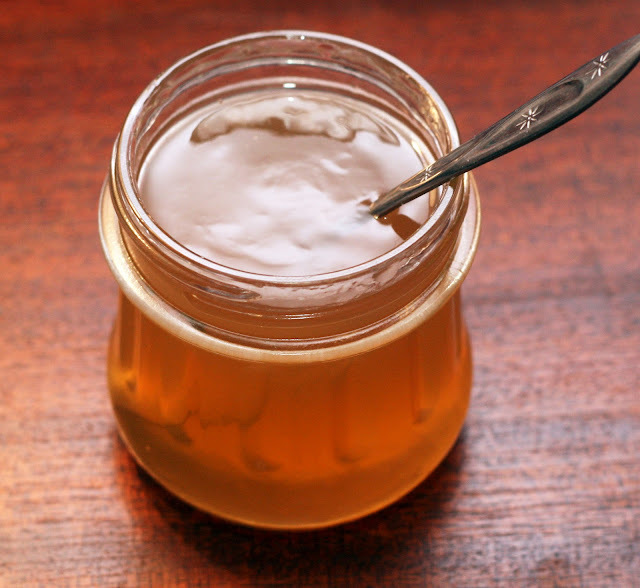 I mostly came across recipes using seed corn but the jelly I had was definitely made with sweet corn so I came up with this recipe. I added the bay leaf to enhance the light corn flavor and I am glad I did. It cut the sweetness a bit and added even more of an herbal note. PS: Today is National Can-it-Forward Day! The perfect day to can with friends. Place all ingredients except for the pork into a food processor or blender and pulse until very smooth. Add the mixture to a marinating container or resealable bag. Add the pork and make sure it is fully submerged/coated in the mixture. Refrigerate overnight. Add the pork and marinade into to a 4 quart slow cooker. Cook for about 8 hours. Shred the meat with a fork and toss to coat in the sauce. 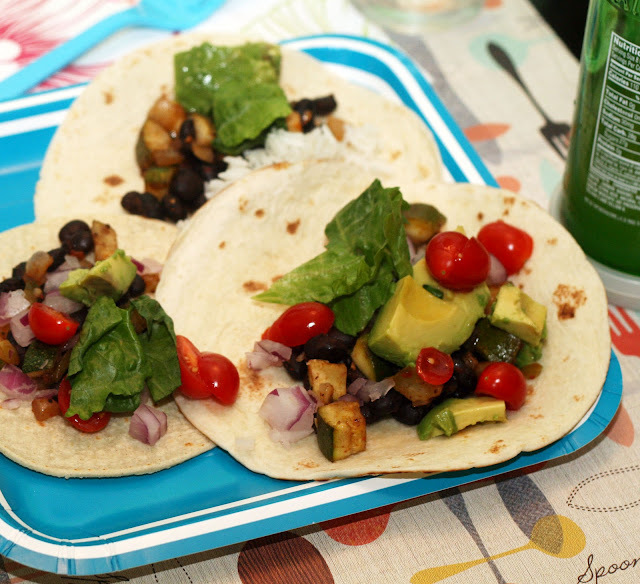 This past weekend we had a taco party as part of McCormick's Dinner Party Chain. I made 3 kinds of tacos and the raw salad with chile-lime dressing I posted Wednesday. Look for more taco posts next week! Tacos were the logical choice for this group as it included vegans and guests who have a rather limited diet. This way everyone got to eat exactly what they could and wanted to. I kept the fillings warm in a triple slow cooker which I bought for the occasion. It worked really well even with the food I didn't slow cook. 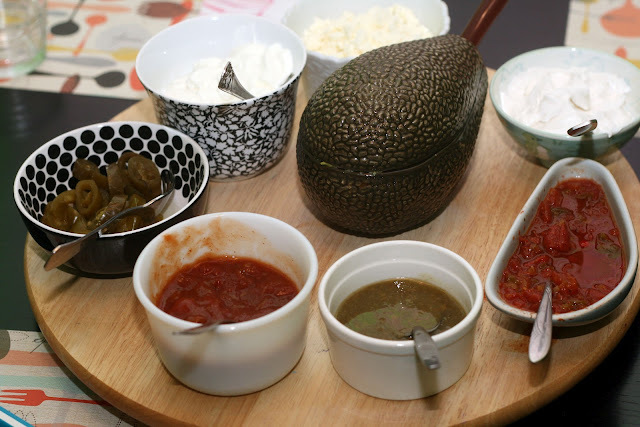 I had a Lazy Susan on duty as well, it held all of the "wet" toppings like guacamole, 3 kinds of salsa, pickled jalapenos, crumbled queso fresco, vegan and regular sour cream. Since we were having people over during a hot spell, I wanted to come up with a menu that included foods that would not heat up the house (no central air conditioning, here!). The other tacos I made could have been made on the grill or inside (in case of bad weather) but I planned all along to make one slow cooker taco filling. 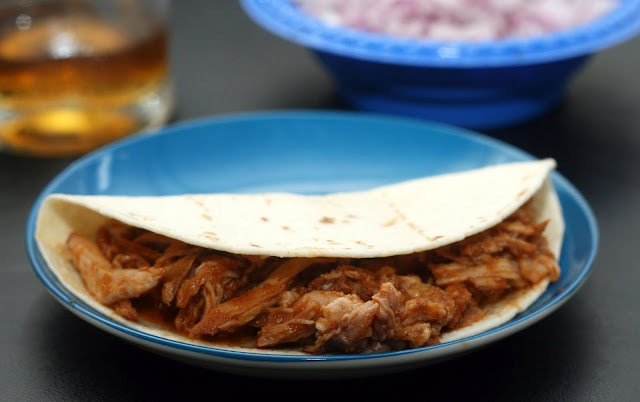 The meat just cooks so well in the slow cooker and requires pretty much no effort on my part. Perfect for entertaining. This was the spiciest taco and I think the one I might of liked the most but I am partial to pork. Toss all of the salad ingredients together in a large bowl. Shake the vinaigrette ingredients in a dressing mixing container or lidded jar. Strain over the salad. Toss to evenly distribute the dressing. Serve at room temperature. Note: Dress the salad immediately before serving. I love using corn raw in salads. It is so crunchy and sweet. This time I was looking for a side dish for tacos and I think I hit the mark. It was slightly hot yet not overwhelmingly so. Full of vegetables and no filler. What is not to love about that? If starting with a new, unused gourd you have to prep it for use. First moisten the inside of the gourd with a bit of water. 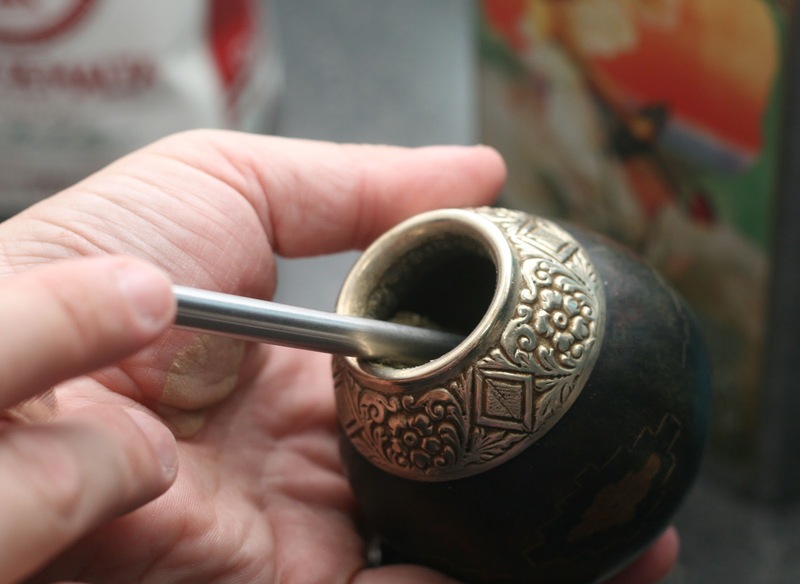 Then use a spoon or the bombilla to gently scrape out any loose bits from inside of the gourd. 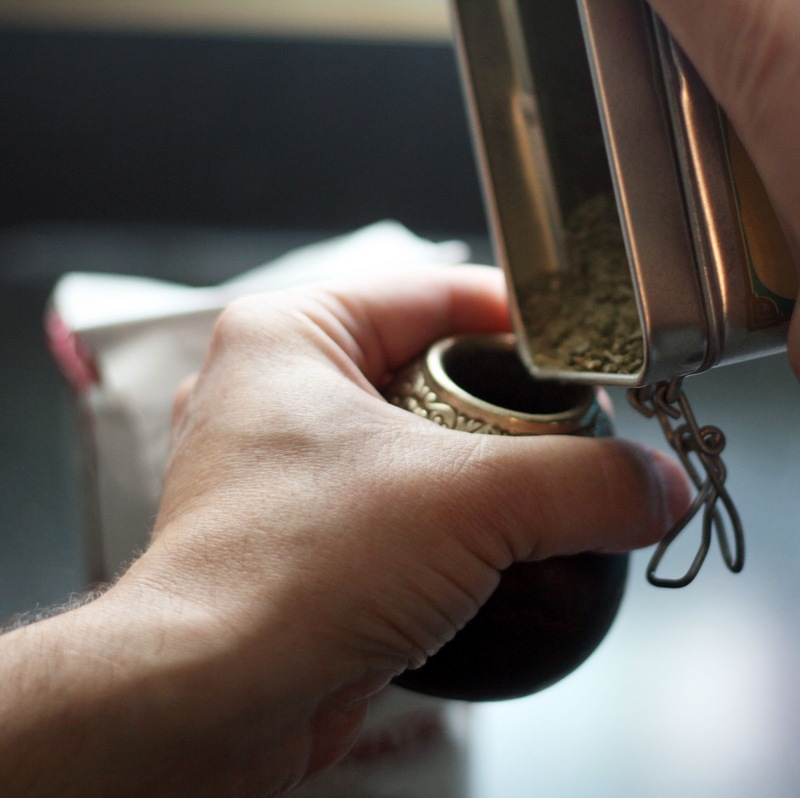 Then fill 1/2 full with yerba mate. Fill with hot water. Allow to sit, filled, for 12 hours. Dump the water and tea out and allow to air dry overnight (or if you are in a humid climate, a full day) until it is completely dry. Repeat this process twice. 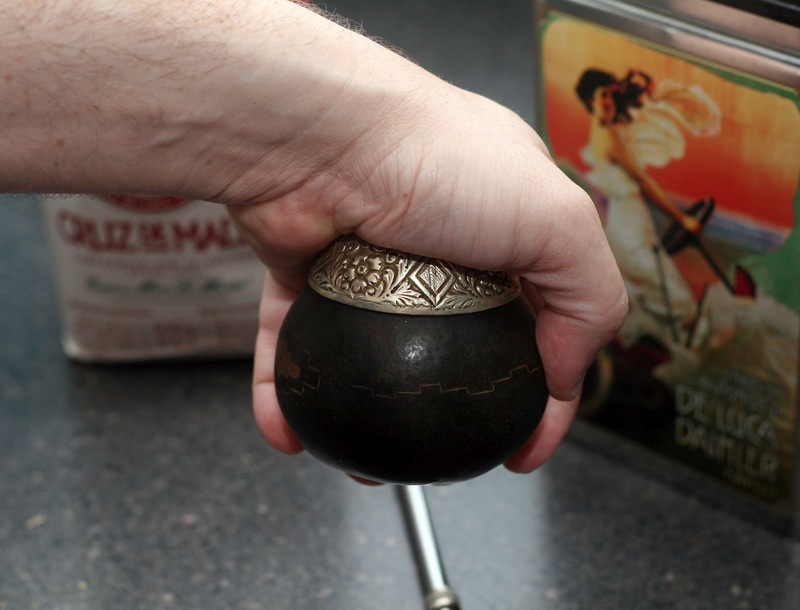 Tap the bottom of the gourd with your other hand. Wet leaves with about a tablespoon of cool water. 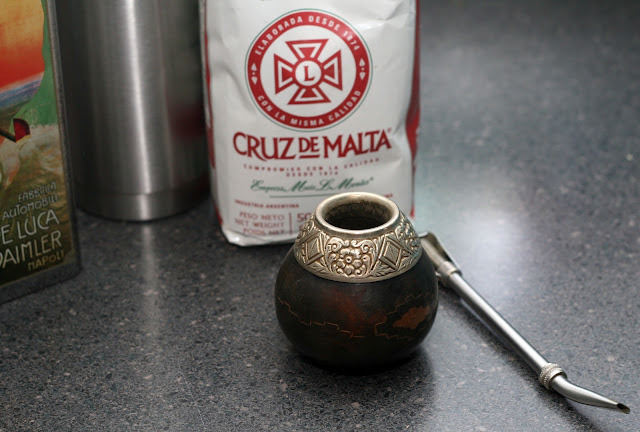 This is said to help keep the mate from "bruising" and my husband says when he does this step, the mate does seem to taste better*. Fill with hot water. 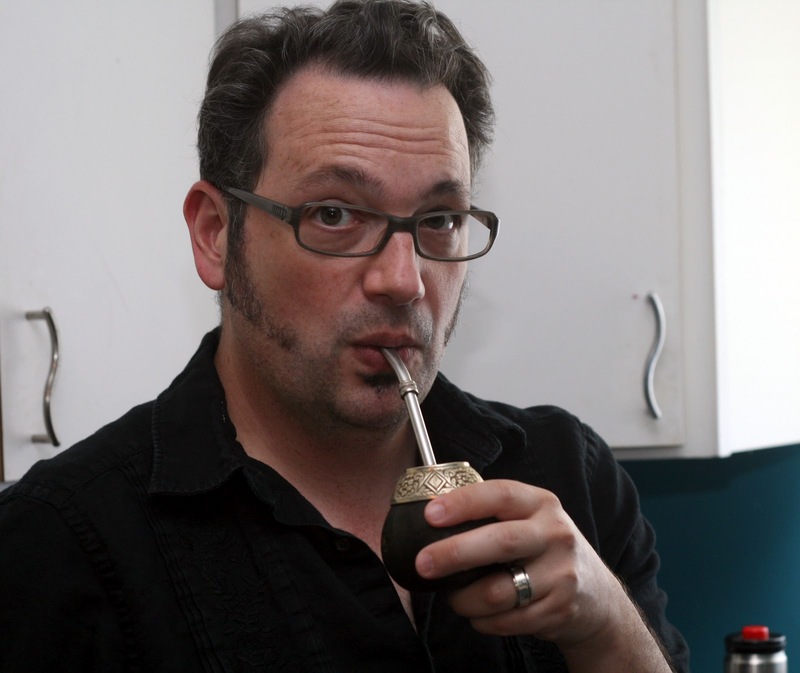 I was excited that Bravo's “Around the World in 80 Plates" will be in Argentina this week (July 11th, 10/9c) because it would be the perfect excuse to share how to enjoy the national drink of Argentina, mate. My husband, Matt, has been drinking mate from the traditional gourd using a bombilla (straw) since before I met him. 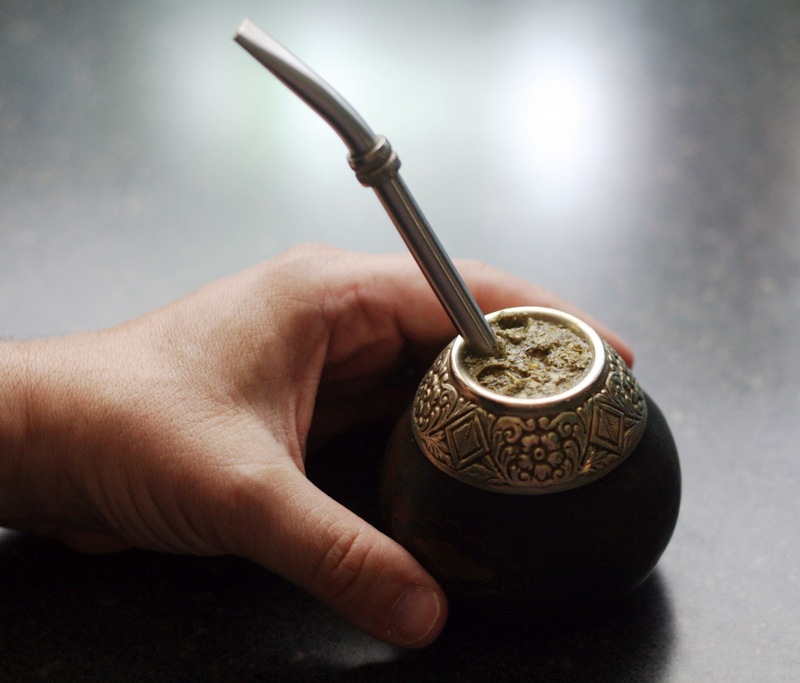 He happily shared with me his technique of readying your gourd before the first use and the proper way to enjoy mate. When he first starting drinking mate after reading about it in a novel, he had a difficult time finding English language instructions on how to prep your gourd and how to drink mate. He eventually figured it out and now has a work gourd and an at home gourd! It is a bit of effort but it is worth it. 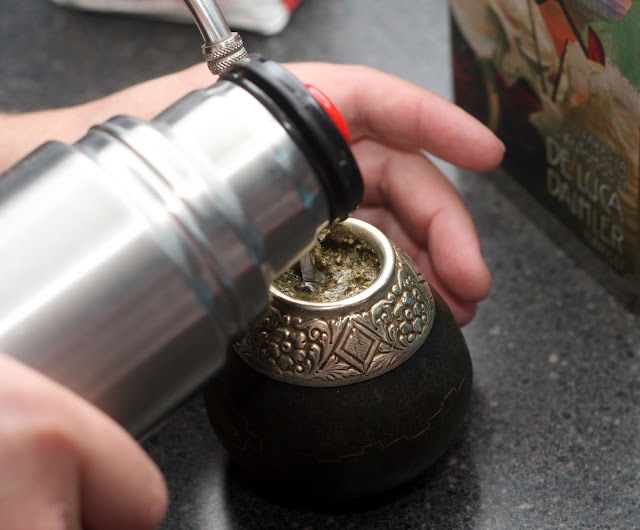 There is no wonder yerba mate is so wildly popular in Argentina that at certain times of the day the work halts for a mate break! 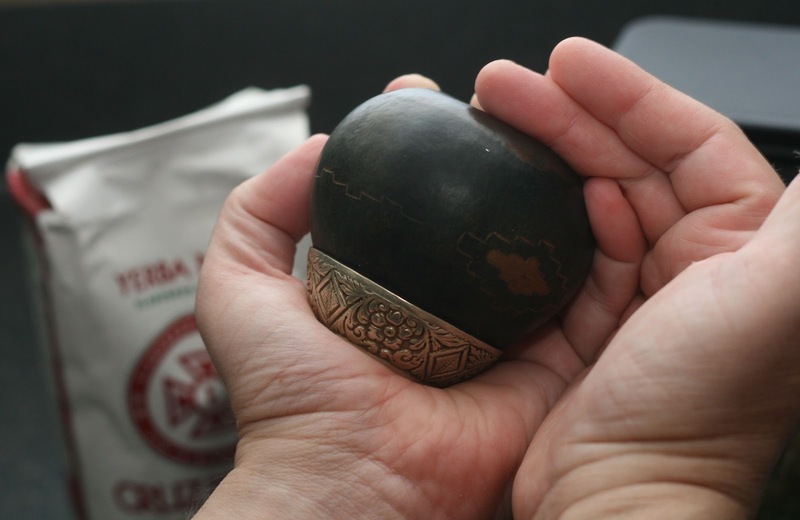 A note about sourcing: There are several places online that sell gourds and bombillas. We've had the best luck at Gaucho Gourmet. We are able to buy the tea at our local Italian (!) grocery but that too is available online. Mix together the beef, pork, veal, egg, shallot, garlic, breadcrumbs and spices until all ingredients are evenly distributed. Form into 4 large patties. Set aside. Drizzle both sides of each tomato slice with olive oil and balsamic. Set aside. Prepare your grill according to manufacturer's instructions. Cook the burgers until just cooked through, flipping once and topping with cheese when nearly fully cooked. Meanwhile, grill the tomatoes, flipping once, until slightly caramelized, about 3-5 minutes. Bonus points: toast the insides of the rolls for 1 minute on the grill. Place a tomato slice on each of the rolls and top with burgers. Eat immediately! When Casey on behalf of Land O'Lakes approached me about sponsoring me to develop a recipe featuring their new Italian cheese blend as part of the Kitchen PLAY 30 Days of Outdoor Dining, I was intrigued. Honestly, I don't normally buy cheese at the grocery store deli counter but I had this idea for a burger that I thought it would be perfect for. 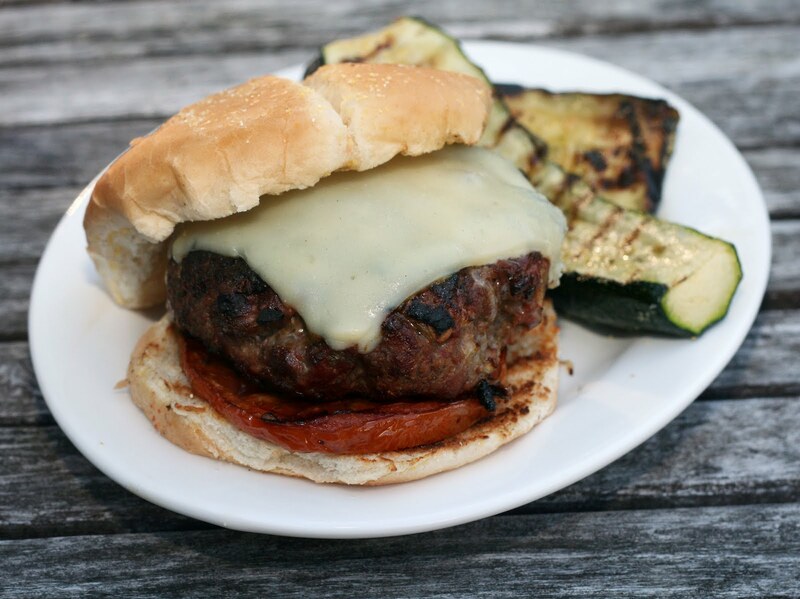 I basically turned my favorite meatball into a more easily grill-able burger. I wasn't sure about toppings so I decided to grill some tomato slices rather than make a sauce. I'm so glad I did because they were fantastic despite it not being quite tomato season yet. They caramelized and sweetened, perfectly contrasting with the savory burgers and cheese! The cheese a blend of Italian cheeses and American. I don't think I've eaten American cheese since about 1984 but the flavor wasn't too present. It mostly tasted like the Italian cheeses but with a more melt-y texture that I think must have come from the American. The melting capabilities were good for a burger; so many Italian cheeses (save mozzarella) do not melt well at all, especially on the grill. The end result tasted sort of like a grilled meatball sub! Very satisfying. It would also be delicious with a more assertive cheese like a smoked provolone. As per Casey Benedict: *Disclosure: This post was sponsored by Land O’Lakes as part of the Kitchen PLAY SideCar series. All opinions given are my own. In a large bowl, toss together the chicken, pasta, cornichons, onion, celery and zest. Set aside. In a small bowl, whisk together the dressing ingredients. Drizzle over the salad and stir to evenly distribute all ingredients. I've been in a picnic foods sort of mood lately. It must be summer. 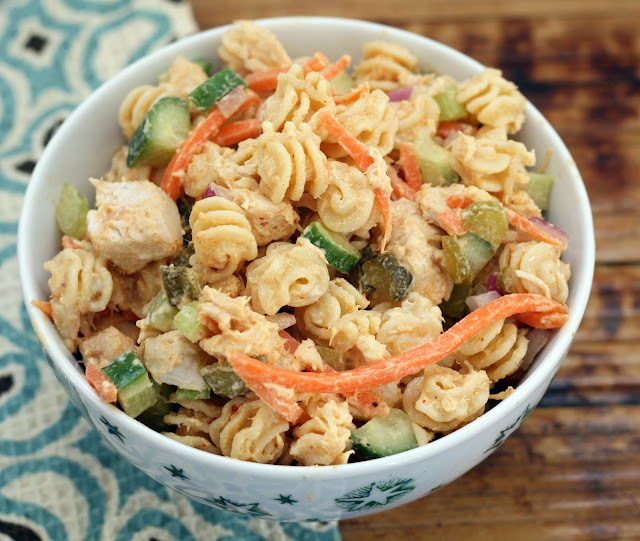 This is a great salad to take to a picnic because it is more of a complete meal than just plain chicken salad thanks to the addition of the pasta. No need to bring bread! I know that some people are mayo-at-a-picnic phobic but that was really only a concern when people were making their own mayo. Commercial mayonnaise holds up just as any other food would at room temperature and follows the same food safety guidelines. Anyway! I had some leftover shredded carrots from another recipe so I tossed them in. Normally I just dice a carrot or leave it out all together but I liked the shredded. It ended up distributing itself better than I think diced would have so you didn't end up with bits of just chicken and pasta at the bottom of the bowl. I've also been enjoying cornichons a lot lately so I used them instead of my usual caper or pickle. 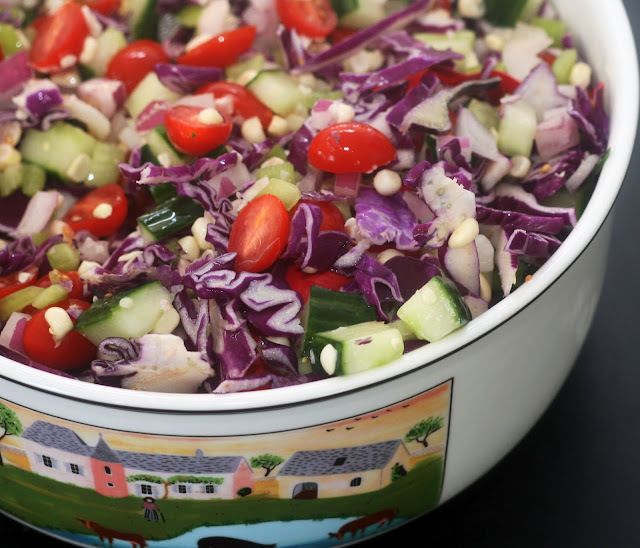 I think every cold salad needs a pickle note; don't you?I know some people don't "need" a recipe for chicken and pasta salad but this one was so unexpectedly tasty, I had to share. Enjoy! Check out my spring (with asparagus and lemon-thyme dressing), autumn (with apples and apple cider dressing) and winter (with sun-dried tomatoes and bacon) chicken pasta salads as well! Saute onions and peppers in olive oil in large skillet until onions are translucent, about 5 minutes. Add the garlic, turkey, and ground spices. Saute until the turkey is brown, breaking up any large pieces with the back of a spoon. Add fresh oregano, pepper sherry, and tomatoes. Cook on medium heat for 15 minutes uncovered. Add olives and currants and cook for 5 more minutes. At this point, the liquid should have reduce so the dish looks well sauced but not soupy. If there is too much liquid cook for an additional 5 - 10 minutes or until the liquid reduces further. Serve over white rice. Matt is always trying to come up with new things to pack for his lunches during the week. He makes a lot of rice cooker meals but occasionally branches out into skillet meals that reheat well. This is what he came up with for this week. 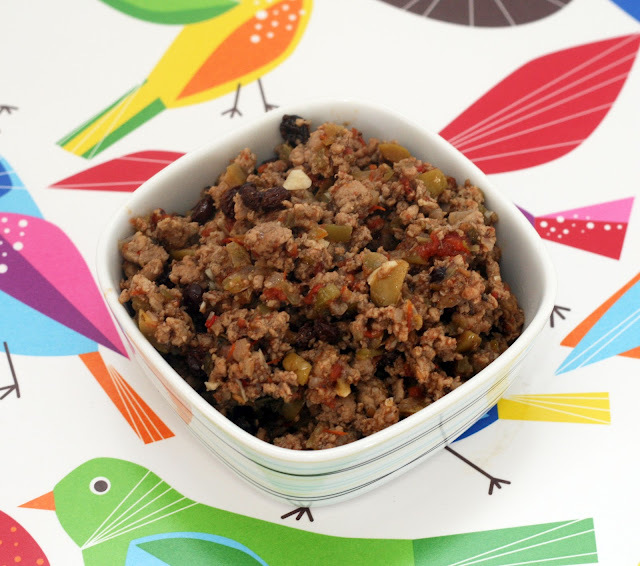 It is lighter version of Cuban picadillo (turkey instead of ground beef) and there some adjustments for personal taste like zante currants instead of raisins and our favorite cubanelle and Anaheim peppers instead of bell peppers but it tastes very much like the real thing just a bit sharper. Of course, you don't have to make this for lunches (we got 3-4 days worth of lunches out of it), it makes a great quick dinner as well. Note: Normally I would serve this over/with rice but Baltimore had a horrible storm this weekend and while we had power, we ran out of rice and on the way out of the neighborhood, someone hit my car. We're fine but the car isn't so no rice was purchased in time for the picture. But serve it on rice!